How does a band follow tricking and treating their entire fanbase on Halloween (with a concert instantly hailed as the greatest of their three-decade career)? If the band in question is Phish, by playing two more of their best recent shows that same weekend at the same venue. Phish closed their fall tour with another Sunday night classic on November 2nd. The final of three sold-out shows at MGM Grand Garden Arena – their only Las Vegas appearances of the last decade – Phish delivered memorable improv from the opening “Runaway Jim” (including a pre-chorus “plinko jam”) through encore “The Moma Dance” > “Slave to the Traffic Light.” The first set climaxed with capricious jamming on “Bathtub Gin” > “Free.” After a restrained start, “Gin” steadily built until transitioning to a double-time disco beat with “backwards guitar”-like effects from Trey Anastasio that transitioned into a vamp ala Velvet Underground’s “Rock and Roll,” and then a stream of hot licks that eventually segued into set-closer “Free.” Living up to its name, “Free” was surprisingly uninhibited: Fish and Trey shouting lines from Halloween’s “Martian Monster” included. The second set began with a half-hour of adventurous, mostly improvised playing. As is often the case this year, set-opener “Chalk Dust Torture” quickly gave way to an exploratory, multi-sectioned jam, before settling to (an equally impromptu version of) “Piper.” The band’s interplay returned during “David Bowie,” as did shouted quotes from “Martian Monster.” The highlight of the night however came with the collective improvisation in set-closer “You In Myself.” Eventually Trey put down his guitar and ran around the stage with the siren of his bullhorn blaring, leading bassist Mike Gordon to chase him. This gave way to a drum duel between all four members of the band (pictured below), and then the customary “You Enjoy Myself” vocal jam. Stream a fan recording of this show for free at phishtracks.com. 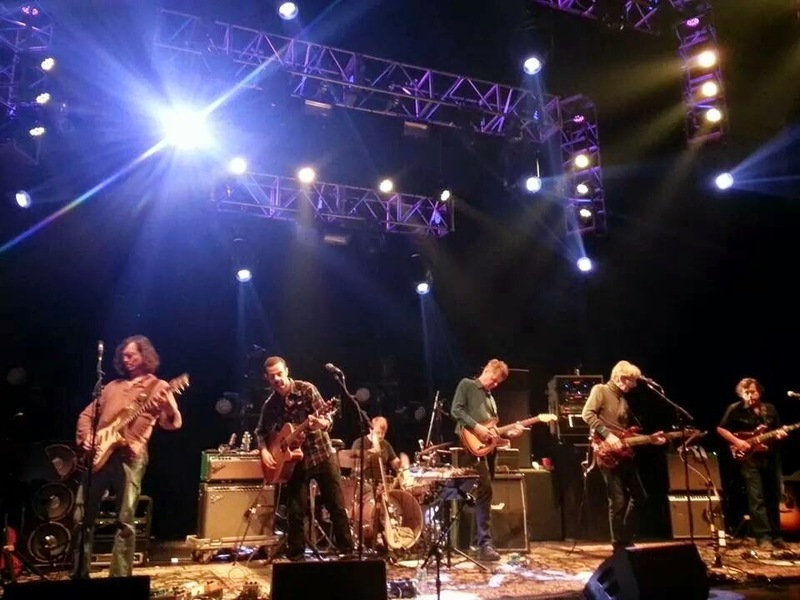 On the second of ten nights (spread over five weekends) in Lesh and Friends’ current run at The Capitol Theatre, four different guitarists were playing in the band: ALO’s Dan “Lebo” Lebowitz, Scott Law, John Kadlecik and Wilco’s Nels Cline. Dark Star Orchestra keyboardist Rob Barraco and drummer Joe Russo (Gene Ween Band, Benevento/Russo Duo, Furthur, Almost Dead) rounded out the lineup . They jammed mostly on Dead classics, as well as the Stones’ “Happy.” An audience recording of this show can be downloaded/ streamed at archive.org. Visit deadheadland.com for photos (like the one below) and more. Pitchfork’s Paris Music Festival concluded last Saturday with webcast shows by Foxygen, tUnE-yArDs and Caribou. Click on the latter two band’s name to watch their full sets (Foxygen’s is below; you can also watch St Vincent and Belle and Sebastian from Halloween night). Deerhoof celebrated both their 20th anniversary and the release of their 12th album, La Isla Bonita, with four shows this week in New York. It began with a surprise set at (soon to be closed) Death by Audio on Sunday. The official start of the La Isla Bonita Tour came Tuesday, the first of three consecutive nights at Baby’s All Right. Photos at brooklynvegan.com. After kicking off their East Coast tour with a costume show on Halloween, on Saturday Sunbears! continued their trek in support of new album Future Sounds, out next week. He’s A Lie! He’s Not Real! 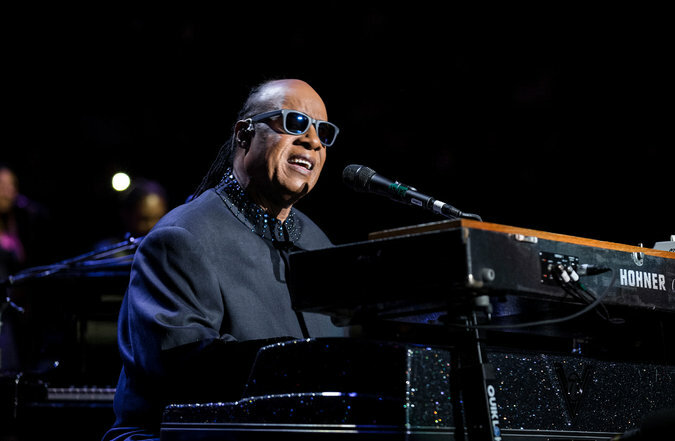 Stevie Wonder kicked off his 11-city Songs In The Key Of Life Tour at Madison Square Garden with a three-hour show that included his entire 1976 classic double LP, plus something extra (pun intended): “Superstition.” In addition to stretching the album out over two sets (with guest India.Arie for several songs), Stevie also preached on gun control, accessibility for the disabled and other topics. Wonder was backed by six vocalists, a string section, two guitarists, three keyboardists, two drummers, two percussionists, a six-piece horn section and bass. More details via The New York Times here. Though Yellowbirds will be missed, they had a proper send-off, described by Sam as “our last and best Yellowbirds show.” Photographic evidence here.